Every year, every single year, this surprises me. So long as I see myself as an organism, a being distinct from the world around me, I suppose it will. I need to work on that. 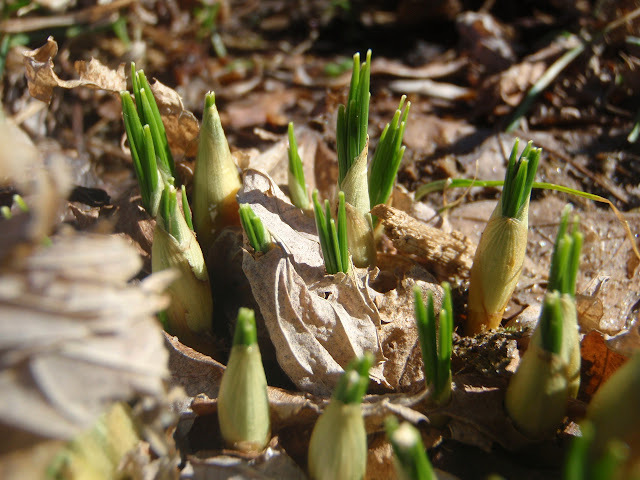 In the meantime, though, I'll bask in the joy that suffuses my soul when I see the year's first crocus stand erupting from the earth. Thought about you in Church today. We are studying Ecclesiastes with an emphasis on living well in our short time on earth because death is waiting for us all-poor, rich, wise, and foolish. I think it is against our culture to think much about death. Too much focus on being/looking young. I appreciate the "balance" you bring to the blogosphere. For me, it's the orange blossoms. Yes, we get sprouts, but when we're gardening year round it's not exactly a sign of grace. But the explosion of colors and smells in the orange blossoms is as if the earth is screaming out the good news. Two feet of snow covers the crocus in my yard. But I know that the snow is insulating them and that last summer's sun gave them energy for this spring. And it will thaw. And we will find them here. So all I can say is, thank you. It's good to see NJ crocus. I truly believe that recognition of mortality helps us lead better lives. And I could use all the help I can get in Church....thanks for the kind words. I remember the oranges in Arizona--that and olives. The oranges taste great off the trees--the olives--hokey smokes they're bitter! We pay too little attention to the good news of the earth. I forget this sometimes. They will come, they will come, as you know. If anyone deserves them now, you do. Thanks for the link and the warm words. Fantastic! There is at least 2.5 feet of snow covering my snowdrops and croci. Your picture reminds me that they are there waiting. I will always plant snowdrops whereever I live because they are the earliest and even here on the north shore of the US, I have seen them in February.